bare ta det helt roligt. som venter på mig når jeg kommer hjem fra job i dag. En hel masse dejlige kort, de fleste er sikkert hjemmelavede. Ikke noget rundt, bare endnu et år, men det er grund nok til at fejre. Jeg skal nok dele dem med jer senere, men det bliver ikke i dag. More Design Paper, Mid Way reminder for ABC Christmas Challenge. challenge at ABC Christmas Challenge, where our lovely host is Carissa. those fantastic papers that you have in your stash. 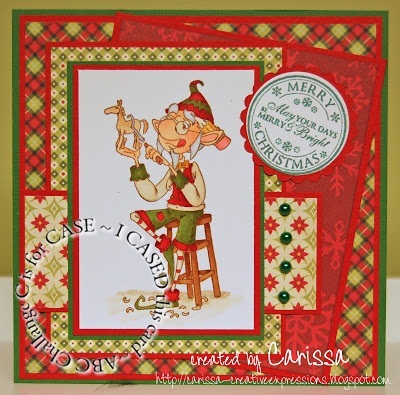 Once again I have used 'Toymaker Elf' from Kraftin' Kimmie. And the papers this time is- also- from MME. made the 'C for Case one of Us' card. Very convenient with a finished coloured image when you are in a hurry. The round sentiment is from Catslife Press. I love this border punch from Martha Stewart. We have two wonderful sponsors joining us this week. to Stamp and Create shop. Our second sponsor is QKR Stamped. Giving 5 Digital Images of the Winner's Choice. then I do hope that you will play along. it could be birds, ladybirds or even butterflies. between unpacking and doing the laundry . Ykk! My card is rather simple. from my favourite company, Maja Design. 'Fika' they are called. I love the purple and kraft together. and the card has made it self!! Giving a $25 gift certificate. Giving a £ 10 gift voucher. Thanks for looking, the DT have all made gorgeous creations for your inspiration. So hop on over to the HM&FMC to see them. D for Design Paper, DT card for ABC Christmas Challenge. with me and you have the picture! my sister and her wonderful family. couple of days couldn't be better, sun, sun and sun! The people are so nice and helpful, and the food (and Glüwine) super. Well, enough about me and back to the new challenge. for my card, Edwin is coloured with Distress Inks. The design papers are from Echo Park. 'Wintertime' I think they are called. with the 'Swiss Dot' embossing folder. At the backside I have used a new snowflake die of mine. and glued a 'handmade by' on top of it. 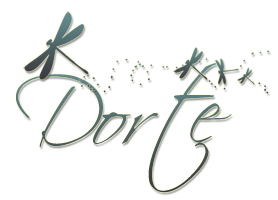 We are so lucky having two fabulous sponsors for this challenge. Top view, from Kristallhütte, Zillertal. Nogle gange lurer jeg på om der er noget galt med mig! genstanden er i hus. Er det bare mig?? Drip Drop Tilda fra Magnolia er et typisk eksempel. Det hjalp lige lidt; bestillingen måtte afsted. Og nu er hun her. lejlighed og lavede et rundt easel kort. De præsenterer sig altid så fint. Jeg har valgt at holde kortet relativ enkelt. Se den lille paraply charm, sød ikke? Jeg lavede plads til en tag i bunden af kortet. Ellers er det lidt af et problem med skriveplads på et easel kort. Jeg var da også nødt il at vise bagsiden. Den er nok så enkel, lidt papir og mit 'Dorte' stempel. Cute Card Thursday- An Eye For Detail! Copy Cat, Mid Way reminder for ABC Christmas Challenge. Wednesday again, I can't believe how fast times flies. 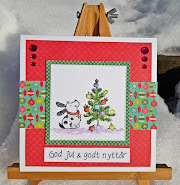 I'm here with a mid-way reminder for this forthnights challenge at ABC Christmas Challenge. C for CASE one of us. one of the DT's cards that you love. 2. Make your own great Christmas card based on the card you picked. 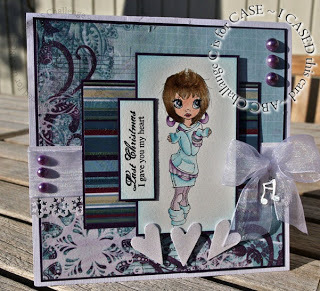 You could be inspired by a sketch, a gorgeous colour combo or a fab embellishment. Please show us the card you have CASE'd. I wanted to have it myself. just jumped up in the basket himself! The papers are from MME, I love the vibrand colours. The round sentiment is from LOTV, and the brads are from my stash. It's difficult to get saturated and bright colours with Distress Inks. A look at the back with my personal stamp. Here is Carissa's wonderful card I have CASE'd. I love her colouring and her choice of papers. The card is from the 'V for Vibrand Colours' in October 2012. Krista Smith, from Saturated Canary. 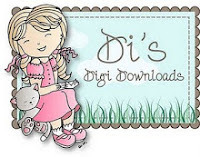 Prize is 2 digi's from Krista's shop for the winner. You can find a lot of inspiration at our blog from my talented teamies. Have fun with C for CASE one of us. 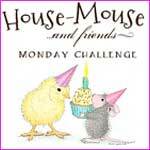 A new challenge is ready for you at House Mouse & Friends Monday Challenge. I Love You Sew Much. or make a creation with an image featuring sewing. please take a look here and have some inspiration..
Look how concentrated he is. If you take a closer look at the needle, you might see it's a real one. Maybe I have to write a warning to the receiver. I couldn't resist making my own embellishments. I made three small embroidery threads. The back side of the card. 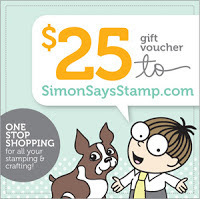 Simon Says Stamp who are giving away a $25 Gift Certificate. H M STAMPS is giving away a $10 Gift Certificate to one lucky winner. Who is giving away a $10 Gift Voucher. I've taken some of the stamped image away like this. Adhesive tape over the part of the subject you do not want. Ink up the stamp and remove the tape. And you are ready to stamp. Here is the original to the right and my manipulated one at the left. I dag har jeg lavet et kort bare fordi jeg havde lyst..
muligheden for at lave kort med forskellige former. Go Kreate L dies og et sæt Grand Scalloped Spellbinders. Og Cuttlebuggen er stadig i hus. Første kort med en die fra Go Kreate ser sådan ud. Kortet er inspireret af min DT kompis Annette. at det er første gang det er i nærheden af stempelsværte. Papiret er en gammel traver fra Basic Grey, 'Bitter Sweet'. Jeg har prøvet at pille det af, men det går ikke! Bagsiden er hel enkel, og ikke har jeg pyntet inden i kortet. Men jeg har hygget mig. til så meget andet end job og familie. ABC Christmas Challenge teamies, Emma. or show a picture of it in your post. From the very beginning I was sure we were going to CASE on of our own cards. The first and only card I could think of was my L for Lyrics card. was one of our sponsores. So here is my new version of my card from last year. Pretty much the same or what do you think? Pearls, angel charm and ribbon are from my stash. and some lovely papers from my favorite company, Maja Design. 'Swirling Lace'. I hope I don't wear it up! Here is the card I've CASED, it's my card from the L for Lyrics challenge in 2012. Our sponsor is Krista Smith from Saturated Canary. Krista makes the most wonderful images. Prize is 2 digi's from Krista's shop. I hope you can come and join us at ABC Christmas Challenge. And please take a look at my wonderful teamies work. More Special Cut, Mid Way reminder for HM&FMC. Spring with Flowers and Blooms!